We spoke with Grace Maturi, Founder of Grace Maturi Events to understand how GetSet for Growth London has helped to move her business forward. Based in both London and Leeds, Grace Maturi Events organises and manages a range of events from weddings to corporate events and specialise in Afternoon Tea Parties complete with vintage crockery. Grace’s mission is to provide fun, unique and stress-free parties for my clients. Her customers are mainly females aged 25 – 40 who are too busy with their careers and social lives to organise their own events and parties. They want a party that is unique and perfect for their Instagram feed and this is where Grace Maturi Events comes in to arrange and host. Through regular monthly meetings with Marketing Advisor, Orsi Toth, Grace was able to see the marketing value of her social feeds, particularly Instagram and was encouraged to develop a content calendar to plan and post regularly. She was also helped to identify her ideal client to support more targeted and relevant marketing content. Finally, additional ideas were suggested to generate alternative revenue streams such as giveaways and ticketed Tea Parties. 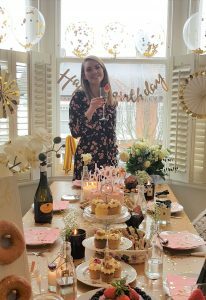 Looking ahead, Grace hopes to grow her business further by running Afternoon Tea parties and other events every weekend, with the help of additional staff. She has already recommended GetSet for Growth to another business owner struggling with her marketing her business and will readily recommend again.